The “Miss You Much Leslie” memorial concert successfully took place on March 31 to commemorate the 10th anniversary of Leslie Cheung’s (張國榮) passing. The Hong Kong Coliseum concert featured performances of Leslie’s classic hits from popular artists Joey Yung (容祖兒), Kelly Chen (陳慧琳), Jacky Cheung (張學友), and many others. The evening was filled with Leslie’s photos and music. It was as if his spirit was alive at the Coliseum. Many top celebrities such as Simon Yam (任達華), Connie Chan (陳寶珠), and Bak Sheut Sin (白雪仙) attended the concert to remember their dear friend. Leslie’s partner, Daffy Tong (唐鶴德) also appeared at the concert with five bodyguards. Leslie’s close friends Shu Qi (舒淇), Sylvia Chang (張艾嘉), Peter Chan (陳可辛), and Teresa Mo (毛舜筠) also shared their memories of Leslie via video messages. The concert’s design was inspired by diamonds. The stage was lit by colorful neon lights with giant playback screens in the back showing video montages of Leslie. The event began with a narration by Leslie’s manager, Florence Chan (陳淑芬). As promised, Florence revealed Leslie’s final message. “On April 1, 2003, 6:43 PM, a thundering sound on the ground shattered many people’s hearts. I was present at the scene but did not know what had happened. I suddenly felt relaxed and my soul seemed lifted from my body. At that time, I heard a voice that said, ‘I can finally sleep well and comfortably now.’ I have never mentioned this to anyone, until one day when I heard this song. Anthony Wong (黃耀明) then took the stage and performed “Glass-like Love” <玻璃之情> and “So Far So Close” <這麼遠那麼近> . Hins Cheung (張敬軒) appeared next and sang Leslie and Anita Mui’s (梅艷芳) classic “Peerless Beauty” <芳華絕代> in Leslie’s famous half-suit, half-dress costume. Joey Yung, Grasshopper (草蜢), Chilam Cheung (張智霖), Vivian Chow (周慧敏), Tai Chi (太極), Leo Ku (古巨基), William So (蘇永康), Andy Hui (許志安), Karen Mok (莫文蔚), and Kiki Sheung (商天娥) each performed their favorite Leslie songs and shared their memories. Kelly Chen danced to a medley of Leslie’s fast songs that included “Stand Up” and “Monica”. 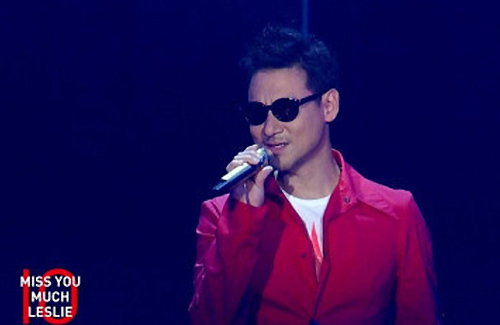 Jacky Cheung sang a rendition of “Craziness” <一片痴> and “For Your Heart Only” <為你鍾情>. The concert wrapped up with an all-star performance of “Wind Blows On” <風繼續吹>. Fans and friends in the audience raised electric candles to pay tribute to the superstar as a video of Leslie performing “Star” <明星> played in the background. Thanks for the Leslie articles. At first, I was a little wary of the memorial concert, as I didn’t want to see opportunistic singers/artist use Leslie’s events as a chance for self-promotion, but on the whole, most of the guest performers made sense as they had a legitimate connection with Leslie. The most touching segments of the night for me were Tony Leung’s intimate dialogue with Leslie (Tony is my other favorite HK star beside Leslie, it’s rare to see him taking such a visible role in any public event/concert because he’s so reclusive) and Teresa Mo’s video reminiscing on her memories of Leslie. She tried to contain her emotions but was still very much affected by Leslie’s death and it clearly showed on her face and voice. I was touched at many points in the concert but after seeing Teresa’s video, I was literally crying because I felt so bad for all the people who were close to Leslie and still missed him so much. – Vivian Chow, although vocally wasn’t as good as in the past, gave a touching performance when she tried to hold back her tears to retell the story. I always loved the song she sang and now I love it more knowing it was from Leslie. – I could tell some of the artist were going through immense pressure as their live performances were not as great as it could be. Still props to them for taking on the challenge!!! I missed this live Memorial Concert. Can someone please, please, please tell me if there’s a repeat. Am residing in Malaysia. Thank you. The tribute concert was really good and meaningful. I like the performances by Tony Leung, Grasshopper, Chilam, Karen Mok and Jacky Cheung. The ambience of the concert will make everyone misses him more. I was at both the 31 March and 1 April concerts. The message revelation was a bit of a disappointment, not quite as the impression given. However, both events were well-organised. Prior to entering the Coliseum for the first night, I was interviewed by iCable and I was asked if I would cry during the concert. I had not thought about it then. I cried a lot on both nights at the end! Jayne, please give us Leslie’s fans a corner her to update Leslie news and happening. Especially to English speaking fans who do not read mandarin/chinese newspaper, be it in HK or foreign countries. Thank you in anticipation.